3 sets a baseline screen for 2. 5 cuts down towards 3. 4 goes to the outside of the 3-point arc. 1 can pass to either 2, 5 or 4 and then cuts to the other side. In this case the pass is to 2. 2 passes to 4 while 5 sets a screen for 3. 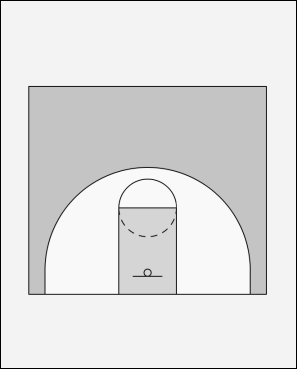 4 can pass in the low post to 3 or to 1 for the 3-pointer. If 3 receives the ball there are pass options to 1 and 5 (don't forget to look for your own shot). 2 cuts to the other corner. 4 sets a screen for 3 for the ball back from 1. 5 steps out. 1 goes up to the guard position. 2 to the forward position and there is a 1-3-1 set.